Paintbrushes for watercolors come in a variety of shapes, sizes and hair types. This article will help you understand the different watercolor paintbrushes so you're not pulling your hair out trying to figure out what's what! If you're not careful you can spend more than necessary (a single size 50 Kolinsky sable round brush costs over $1000!) or buy an inferior brush that quickly loses it's shape and leaves you disappointed. 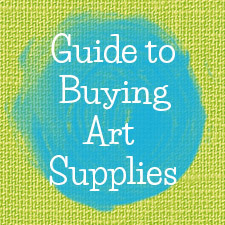 Like it so often does with art supplies, selecting paintbrushes for watercolors ultimately comes down to personal preference. Your choice rests on the watercolor techniques you like to use, how much you're willing to spend, and simply how certain brushes feel in your hand. In helping you narrow down your options we'll look at hair, shape and size and then I'll try putting it all together with some recommendations. When selecting a particular hair or fiber you need to look at performance, resilience and cost. In terms of performance, a brush should be able to hold a good amount of paint or water in its belly, be able to maintain a fine point, and distrubute the medium smoothly and evenly on the surface. The brush should spring back to it's proper shape after each use and be able to maintain that shape for as long as possible. Finally, you need to consider how much you're willing to pay because some brushes are very expensive and depending on your aims, you may not need them. 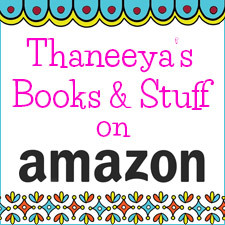 You can buy paintbrushes for watercolors cheaply online and help your decisions along by reading artists' reviews. But sometimes it helps to go into a store and hold different brushes in your hand. You can test the snap of the brush, see how much water it holds in its belly and make sure the ferrule (the silver part between the bristles and the handle) is top notch. The sable - source of sable brushes. The best paintbrushes for watercolors are made from sable hair, which comes from the tail of the sable, a species of marten found throughout north Asia (seen below). The very best sable hair is called Kolinsky sable because it's sourced from a weasel (not actually a sable) living in the Siberian region of Kolinsky where the harsh conditions cultivate hairs that are resilient and supple. 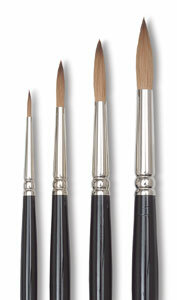 Sable brushes, when properly cared for, will maintain their shape and texture for years. As you'd expect, they're expensive! Kolinsky sable is most important for professional artists. They are used in a range of brush shapes, but are best put to use in round brushes that need to hold a point and maintain their shape. You'll see some brushes labelled "pure" sable or "red" sable. These are a step down from Kolinsky sable, but are still good alternatives if you're on a budget. 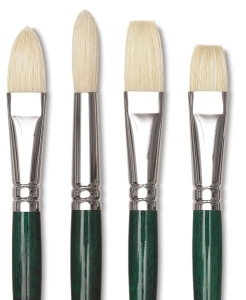 All three of these varieties are inferior to sable and should not be bought on round brushes because they don't hold a point very well. They are, however, well suited on brushes for wash techniques. Squirrel and goat hairs are well suited to mop and wash brushes, while the strong but coarse texture of ox hair makes it suitable for flat, square-cut brushes. Ox hairs that have been dyed to resemble red sable are called sabeline brushes. 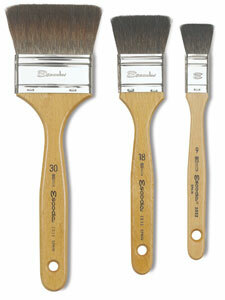 Hog bristles are well suited to large wash brushes because they can carry and distribute a lot of paint. 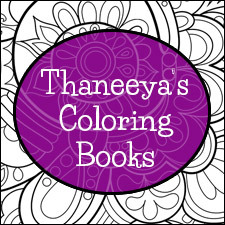 They're quite durable and relatively inexpensive.These are a good option if you want a brush that can put down a lot of color and take a beating. Quality can vary widely, so look for China bristles, which are the best variety. Camel hair is not from camels, but is actually an umbrella term for a whole range of natural hair blends that are usually of inferior quality and best avoided. Synthetic fibers, usually made from nylon or polyester, are designed to mimic the structure and performance of natural hairs at much lower the cost. They can vary greatly in quality and performance but generally hold a good point. They do have some disadvantages: they won't last as long as natural hair and they don't hold as much paint or distribute it as evenly as natural hairs because their bristles are too smooth. Some manufactuers have produced synthetic bristles with tiny flags or ridges to improve paint carrying ability. Synthetic fibers are a good alternative for round brushes if you can't afford sable because they'll hold a point better than most other natural hairs. Some manufacturers produce brushes made with a combination of sable and synthetic fiber or sable and some other less expensive natural hair. Some of these brushes are cheap alternatives with good performance but it varies by manufacturer. Before buying one of these brushes I recommend you see it for yourself in the store or see how it's reviewed by other artists. 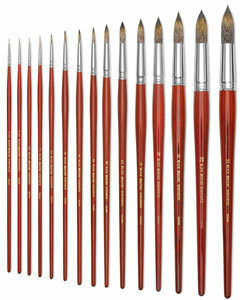 When it comes to paintbrushes for watercolors there are numerous different shapes suited to a variety of techniques. Brushes are simply tools that perform different tasks. Your choice will be different from someone else because you favor certain techniques over others. Brushes are also expensive, so you need to buy the fewest number of brushes capable of performing the widest range of jobs. In looking at the different brush shapes for watercolor painting, I've split them up into three main catagories: versatility, detail work, and wash work. 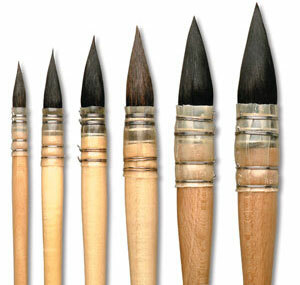 Round brushes are the most versatile and widely used brush for watercolor painting. Their shape makes them suitable for small details and delicate lines, but also for broader strokes and washes. If you're thinking of splurging on a high quality hair, like Kolinsky sable, it will be best put to use in the form of a round brush. If you find sable too expensive, try a synthetic or combination round brush. Flat brushes (also known as "one-strokes") aren't as versatile as round brushes, but they're useful for both washes and strong linear strokes. Buying a high quality hair is less important than for a round brush but you still want it to be durable. They're available in sable but for most artists it's fine to save money by going with another natural hair or synthetic fiber. Round brushes are quite well-suited to detail work, but if you paint a lot of detail you should consider getting spotter or rigger brushes. 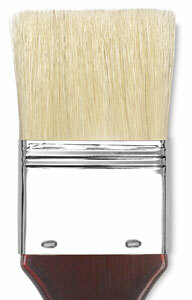 A spotter brush is like a small round brush with shorter bristles for extra control. 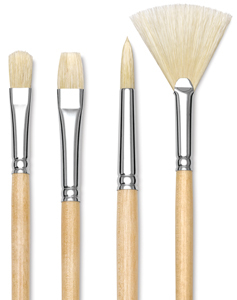 Also called retouching brushes, they're excellent for minute details. Rigger brushes (which get their name because of their use painting the rigging on sailing ships) are round brushes with extra long bristles. This gives it good paint holding capacity with an extra fine point suited to continuous lines. Buying high quality hair with these brushes will be cheaper (because they're small) and well worth it because it's important that they maintain their shape over time. Selecting a brush size is rather straightforward. 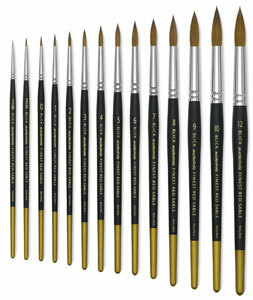 Large brushes are good for bold strokes and washes, small brushes for detail work, and mid-sized brushes for versatility. But unless you're Gerhard Richter, you can't afford to buy every size for each brush shape so you have to make some choices. Sizes range from 0000 right up to 50, but you won't need most of them. You should have a good range of round brushes, but buy other brushes (like wash brushes) selectively depending on how you plan to use them. Sizes can differ amongst manufacturers, so this size chart will help you make your selection. 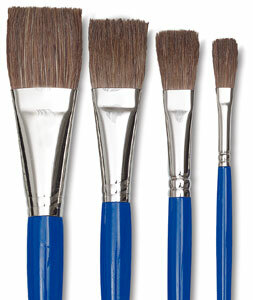 If you're buying your first paintbrushes for watercolors, I'd recommend three round brushes: small (around size 3), medium (5-6), and large (12). Because of their versatility, they'll be all you need in the beginning. In fact, you could paint an entire painting with one medium round brush (I have) but it's a bit slow and inconvenient. 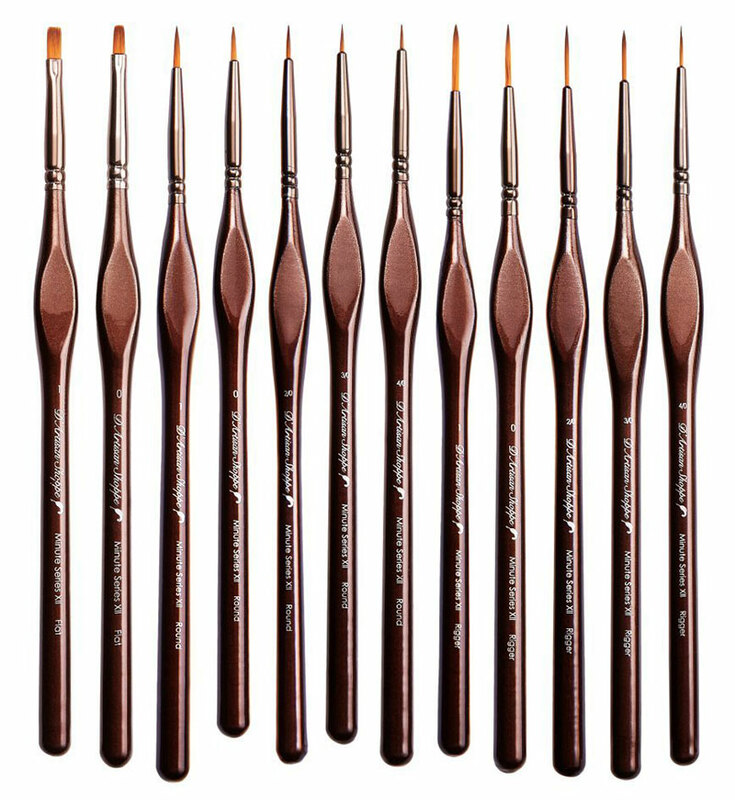 It's important for round brushes to hold a point and maintain their shape, so you should spend more money on these than on other brushes. Try for sable and if you're serious about your art get at least one Kolinsky sable brush, specifically a small to medium round brush with which you'll really notice the performance. If sable is beyond your budget, try a sable-synthetic blend or solely synthetic brushes which still offer good performance - but won't last as long. Your decision to buy more brushes depends on whether you'll use them or not. If you're someone who likes painting detailed works, you can consider getting a spotter or rigger brush. Because their shape is so important, it's a good investment to buy Kolinsky sable, and because they're so small it won't be terribly expensive. But for most artists reading this, a good small round brush will be sufficient for detailed work. You can use your large round brush for washes, but for convenience it's fine to buy a dedicated brush for the task. A good flat brush will come in handy because the edge can also be used for bold, linear strokes. 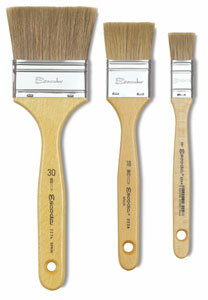 Ox hair is a good choice for flat brushes and won't break the bank. For washes, you can also invest in a good hog bristle brush which will last a long time. Other artists like using mop or oval brushes. Once again you can save some money by getting a cheaper hair. Below is a selection of paintbrushes available online from reputable brands, sorted by hair type. 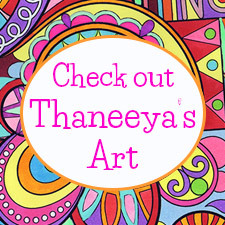 When you make a purchase through our site I get a small commission that keeps it up & running and free! 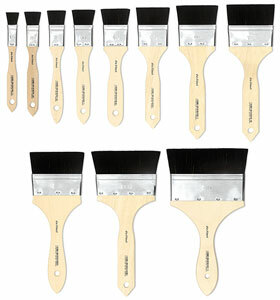 Instead of buying paintbrushes individually, you could also consider buying them in a set. 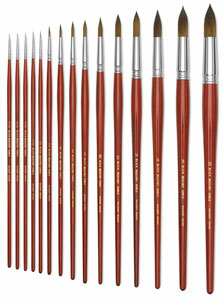 The Maestro Series XV Paint Brush Set comes with 15 paintbrushes in a convenient carrying case. 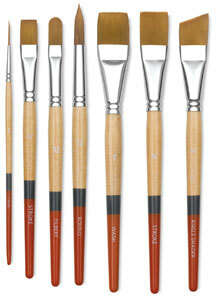 11 of the brushes are made from a synthetic that mimics soft natural sable, which can be used with both watercolors and acrylics. I used them with watercolors and loved the quality of the brushes. 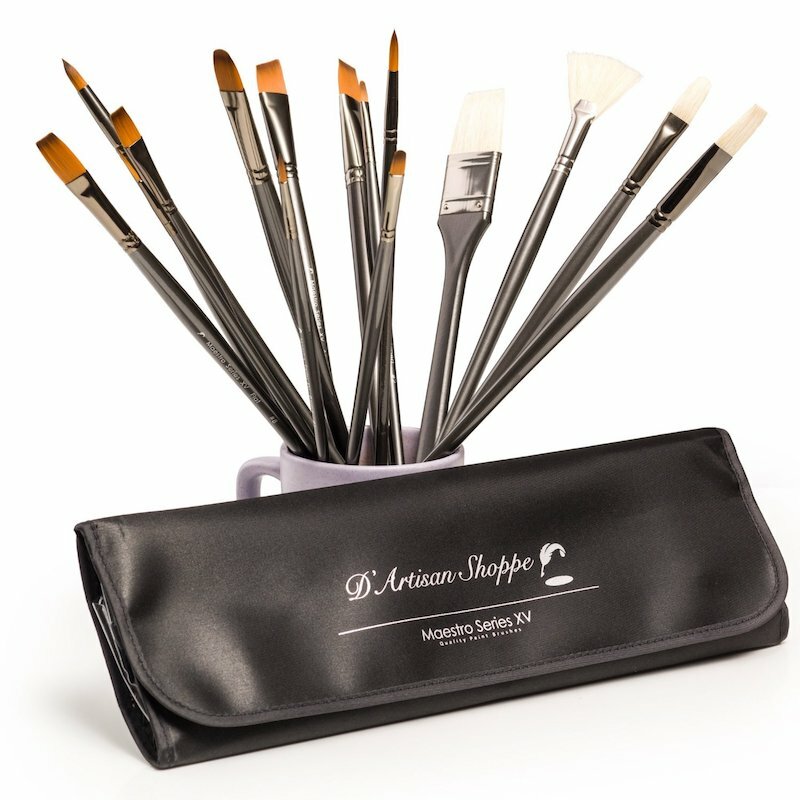 This set also includes 4 stiff hog hair brushes for use with acrylics and oils. If you like to paint small details, the Minute Series XII is an affordable, high-quality option that includes 12 brushes that are perfectly sized to fit in small places (for instance, if you're painting in one of my coloring books ). These brushes include pointed rounds, flats and liners/riggers that are also great for painting miniatures, models, rocks, and delicate features like eyelashes, hair and fur. The bristles are made of synthetic hair which means you can comfortably use these brushes with more than just watercolors. I've enjoyed using these paintbrushes with gouache and acrylics in addition to watercolors and found that they work well with all three mediums.